World and NCAA champion Josh Schneider shares one of his favorite sprint sets that will help you build blistering back-half speed in your 100’s. Later this year Cincinnati’s Josh Schneider will race for a spot on the team the United States is sending to Rio. Josh, who started swimming at the age of 14 is one of the quickest men on the planet, winning the 50 yard freestyle at the 2010 NCAA Championships as a senior with the University of Cincinnati. Last summer he won gold in the 50m free at the Pan American Games, and has racked up a few short course world championship relay medals as well. But for today he dropped by to share one of his favorite sets for sprint awesomeness. The swim workout is designed primarily to help improve the back-half of your 100m race, and features between 750-950 of what is essentially flat-out, pedal-to-the-floor swimming with plenty of rest to insure a high level of quality. “We’ll do this on a Saturday usually,” says Schneider. The workout was designed and given to him by Mandy Commons-DiSalle, who has been head coach of the Cincinnati Bearcats swimming and diving program since 2014. The not-so-secret secret to swimming fast is training the way you want to race so that when it comes to racing all you have to do is swim like you train. Simulating competition includes the way Schneider warms up for this workout. “We’ll start with everyone doing their individual meet warm-up routine,” he says. 50 #1 is from a dive. Second 50 is from a push. 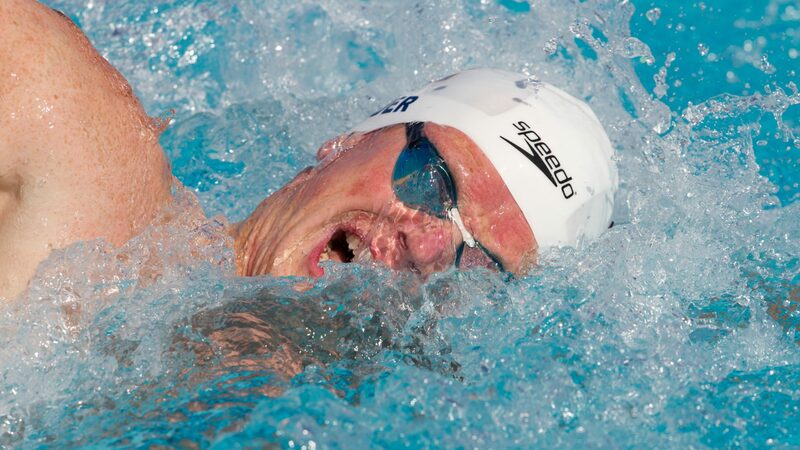 “The goal is trying to get as close as possible to the time you swam on the first 50,” notes Josh. 3 x 50 All-Out from a Dive. “The goal is to beat the results of the dive 50’s from the previous set,” says Schneider. Long rest; 3 minutes between 50’s. At least 400-700 easy, mixing in kick to flush out legs. Thank you to Josh for taking the time out of his training to share this set. You can follow Josh on his way to Rio by catching up with him on Twitter. Originally published over at YourSwimBook.com. Josh Schneider’s favorite lifting set: Grabbing two mid-sized sedans off the street, hoisting them over his head, and throwing them 160 feet into the neighboring river. Hahaha I just like that you’re Swimmer B. Respect. Happy to read he sometimes trains in the pool. I believed he was 24/7 in the weight room.